Leonotis leonurus is primarily bird pollinated and the flower presentation and pollination mechanisms are all structured to support this type of pollinator. The flowers contain sweet nectar that attract many nectivorous birds such as sunbirds which include the Whitebellied, Black, Yellowbellied, Olive, Collared and Marico Sunbirds. 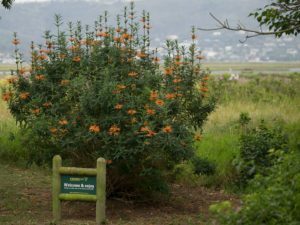 The curved beaks of these African birds which are used for feeding from these tubular flowers have been a contributing factor to the brilliant orange-red colour and tubular shape of these flowers due to co-evolution.